DVR, i.e. digital video recorder, is a consumer electronics device or application software that lets you record videos in a digital format. If you've had lots of DVR recording files, chances are you want to convert DVR to AVI for more convenient uses. Yeah, AVI is one of the most widely used formats. It has the vast support of hard devices like Blackberry, Xbox 360, PSP, Sandisk Sansa, Archos and Creative Zen, etc. And lots of application software like Windows Movie Maker and Adobe Premiere also accept the format. No matter for what reason you choose to convert DVR to AVI, you have to find a powerful and easy-to-use video converter as your assistant. I dare to say, Wondershare UniConverter (originally Wondershare Video Converter Ultimate) is the exact one you want. It not only lets you convert your DVR files to any common audio or video format including AVI, but also enables you to directly convert DVR files to various devices and applications with the best output effect. 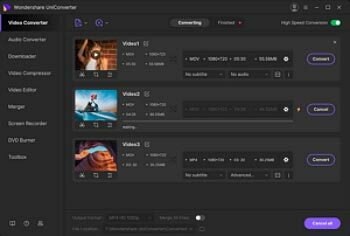 What's more, it also provides you with a great built-in video editor, so you can trim, crop, merge, rotate videos, or add subtitle, background music, watermark, and kinds of effect etc. The tutorial below will walk you through four steps for converting DVR files to AVI files. 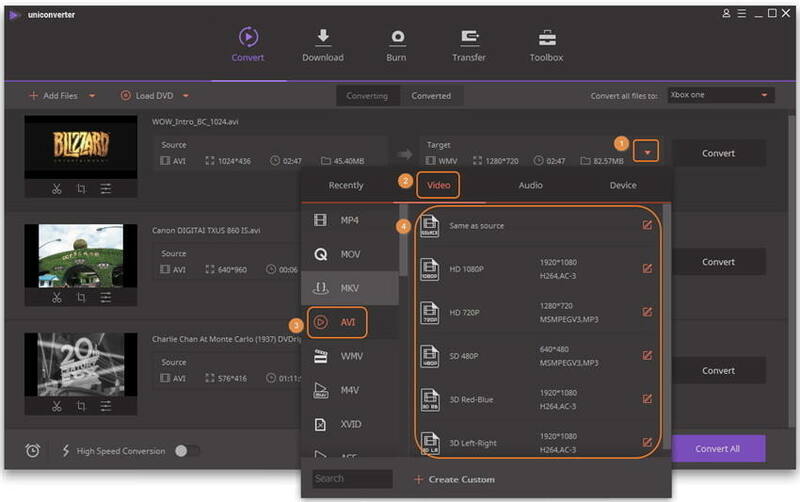 Simply drag and drop DVR recording files from your PC to the DVR to AVI video converter (these files will be displayed as thumbnails in this app's left pane). If need, you can click the video thumbnails to preview these files. This app supports batch conversion. It means you can import several files at a time. Note: If you have some DVR recording clips and want to merge them into one, you need to tick the "Merge all videos into one file" option at this time. Crop: Cut off black margins of the video, customize the screen size, rotate your video 90 degrees, and adjust volume. Trim: Remove any clip of the video you don't want. Effect: Apply various cool effect to your video. Subtitles: Enable you to add the plug-in subtitles or customized subtitles. Watermark: Embed picture or text watermarks to the video. This app supports almost all popular devices. You can select AVI or the device as the output format. To choose AVI, just click the icon from the Target box and select Video tab, choose AVI in the left sidebar and select the video resolution in the right to confirm the output format. Note: If you want to play DVR on some device, just go to Device category to find your device there. The default presetting can fit the device best. On the lower-right corner of the window, simple click the Convert All button. Instantly, you'll notice this app is starting converting your DVR files. During the process, you can also cancel or pause conversions easily. Wondershare UniConverter (originally Wondershare Video Converter Ultimate) works effectively, and the purple process bar will show you the conversion progress. After conversion, just switch to the Converted tab to find the converted files. If you need to play them on your device, just transfer them to the device via cable.